Vehicles of categories M1, M2, M3, N1, O1 and O2 (1) on grounds of rear underrun protection. 1.3. Vehicles where any RUPD (e.g. fixed, removable, foldable, adjustable, etc.) is incompatible with their use on traffic roads may be partly or fully exempted from this Regulation, subject to the decision of the Type Approval Authority. 2.1. All vehicles shall be so constructed and/or equipped as to offer effective protection over their whole width against under-running of vehicles mentioned in paragraph 1 of this Regulation in the event of rear collision with vehicles of category M1 and N1 (2). 2.2. The vehicle shall be tested under the conditions as laid down in paragraph 2 of Annex 5. If, in case of vehicles of categories O1 and O2 where the tyres project for more than half of their width outside the bodywork (excluding the wheel guards) or outside the chassis in the absence of bodywork, the ground clearance of the rear part of the unladen vehicle does not exceed 550 mm over a width which is not less than 100 mm deducted from the distance measured between the innermost points of the tyres (excluding any tyre bulging close to the ground), on either side. Where there is more than one rear axle, the width to be considered is that of the widest. That may have interruptions totalling not more than 200 mm. over a width which is not shorter than that of the rear axle by more than 100 mm on either side (excluding any bulging of the tyres close to the ground). That may have interruptions summing up in not more than 200 mm. ‘Separate cab’ means a cab attached to the vehicle's frame by specific links and which has no common part with the cargo area. ‘Type of RUPD’ means RUPDs which do not differ with respect to the essential characteristics such as shape, dimensions, attachment, materials and the markings cited in paragraph 5.2.2 below. 5.1. The application for approval of an RUPD shall be submitted by the manufacturer of the RUPD or by his duly accredited representative. A sample of the type of RUPD: the sample shall be clearly and indelibly marked on all its main components with the applicant's trade name or mark and the type designation. 5.3. An RUPD representative of the type to be approved shall be submitted to the Technical Service responsible for conducting the approval tests. 5.4. The Type Approval Authority shall verify the existence of satisfactory arrangements for ensuring effective control of the conformity of production before type approval is granted. 6.1. If the RUPD submitted for approval pursuant to this Regulation meets the requirements of paragraph 7 below, approval of that type of RUPD shall be granted. 6.2. An approval number shall be assigned to each type approved. Its first two digits (at present 03 corresponding to the 03 series of amendments) shall indicate the series of amendments incorporating the most recent major technical amendments made to the Regulation at the time of issue of the approval. The same Contracting Party may not assign the same number to another type of rear underrun protective device. 6.3. Notice of approval, or of extension or of refusal of approval of a type of RUPD pursuant to this Regulation shall be communicated to the Parties to the 1958 Agreement which apply this Regulation, by means of a form conforming to the model in Annex 1 to this Regulation. The number of this Regulation, followed by the letter ‘R’, a dash and the approval number to the right of the circle prescribed in paragraph 6.4.1. 6.5. The approval mark shall be clearly legible and be indelible. 6.6. Annex 4 to this Regulation gives examples of arrangements of approval marks. 7.1. The cross-member shall have a section height of at least 120 mm. The lateral extremities of the cross member shall not bend to the rear or have a sharp outer edge; this condition is fulfilled when the lateral extremities of the cross-member are rounded on the outside and have a radius of curvature of not less than 2,5 mm. RUPD intended to be fitted on vehicles of categories M, N1, N2 with a maximum mass not exceeding 8 t, O1, O2, on vehicles of category G and on vehicles fitted with a platform lift, the cross-member shall have a section height of at least 100 mm. 7.2. The RUPD may be so designed to have several positions at the rear of the vehicle. In this event, there shall be a guaranteed method of securing it in the service position so that any unintentional change of position is precluded. The force applied by the operator to vary the position of the device shall not exceed 40 daN. For RUPD that are designed to have several positions at the rear of the vehicle, a label shall be provided either with (a) symbol(s) or in the language(s) of the country where the device is sold to inform the operator about the standard position of the RUPD to offer effective protection against under-running. 7.3. The RUPD shall offer adequate resistance to forces applied parallel to the longitudinal axis of the vehicle. (This shall be demonstrated in accordance with the test procedure and test conditions specified in Annex 5 to this Regulation.) The maximum horizontal deflection of the RUPD observed during and after the application of the test forces specified in Annex 5 shall be recorded on the type approval communication (Annex 1, item 8). The maximum lateral clearance measured between the elements of the underrun device and the elements of the platform lift, which move through the interruption when the lift is operated and which make the interruption necessary, may amount to no more than 2,5 cm. The individual elements of the underrun protection, including those outboard of the lift mechanism, where provided, shall have an effective surface area, in each case, of at least 420 cm2. For cross-members with a section height of less than 120 mm, the individual elements of the underrun protection, including those outboard of the lift mechanism, where provided, shall have an effective surface area, in each case, of at least 350 cm2. In the case of vehicles having a width of less than 2 000 mm and where it is impossible to achieve the requirements of paragraphs 7.4.2 and 7.4.3, the effective surface may be reduced on the condition that the resistance criteria are met. Every rear underrun protective device approved under this Regulation shall be so manufactured as to conform to the type approved by meeting the requirements set out in paragraph 7 above. The Type Approval Authority that has granted type approval may at any time verify the conformity control methods applied in each production facility. The normal frequency of these verifications shall be one every two years. 9.1. The approval granted in respect of a type of RUPD pursuant to this Regulation may be withdrawn if the requirements set forth above are not met or if the protective device has failed to pass the test prescribed in Annex 5. 9.2. If a Contracting Party to the Agreement applying this Regulation withdraws an approval it has previously granted, it shall forthwith so notify the other Contracting Parties applying this Regulation, by means of a communication form conforming to the model in Annex 1 to this Regulation. Require a further test report from the Technical Service responsible for conducting the tests. 10.2. Confirmation or refusal of approval, specifying the alterations shall be communicated by the procedure specified in paragraph 6.3 above to the Parties to the Agreement applying this Regulation. 10.3. The Type Approval Authority issuing the extension of approval shall assign a series number of such an extension and inform thereof the other Parties to the 1958 Agreement applying this Regulation by means of a communication form conforming to the model in Annex 1 to this Regulation. If the holder of the approval completely ceases to manufacture a type of rear underrun protective device approved in accordance with this Regulation, he shall so inform the Type Approval Authority which granted the approval. Upon receiving the relevant communication that Authority shall inform thereof the other Parties to the 1958 Agreement applying this Regulation by means of a communication form conforming to the model in Annex 1 to this Regulation. The Parties to the 1958 Agreement applying this Regulation shall communicate to the United Nations Secretariat the names and addresses of the Technical Services responsible for conducting approval tests and of the Type Approval Authorities which grant approval and to which forms certifying approval or extension or refusal or withdrawal of approval, issued in other countries, are to be sent. The approved RUPDs fitted to the vehicle. 13.2. Other definitions applicable to this Part II are contained in paragraph 3 of this Regulation. 14.1. The application for approval of a vehicle type with regard to the installation of an RUPD(s) of an approved type shall be submitted by the vehicle manufacturer or by his duly accredited representative. At the request of the Type Approval Authority the type approval communication form (i.e. Annex 1 of this Regulation) of each RUPD shall also be supplied. 14.3. A vehicle representative of the type to be approved and fitted with an approved RUPD shall be submitted to the Technical Service responsible for conducting the approval tests. 14.3.1. A vehicle not comprising all the components proper to the type may be accepted for test provided that it can be shown by the applicant to the satisfaction of the Type Approval Authority that the absence of the components omitted has no effect on the results of the verifications, so far as the requirements of this Regulation are concerned. 14.4. The Type Approval Authority shall verify the existence of satisfactory arrangements for ensuring effective checks on conformity of production before type approval is granted. 15.1. If the vehicle submitted for approval pursuant to this Regulation is provided with an approved RUPD and meets the requirements of paragraph 16 below and has been tested following the conditions set out in paragraph 2.2, approval of that vehicle type shall be granted. 15.2. An approval number shall be assigned to each type approved. Its first two digits (at present 03 corresponding to the 03 series of amendments) shall indicate the series of amendments incorporating the most recent major technical amendments made to the Regulation at the time of issue of the approval. The same Contracting Party may not assign the same number to another vehicle type. 15.3. Notice of approval or of extension or of refusal of approval of a vehicle type pursuant to this Regulation shall be communicated to the Parties to the 1958 Agreement which apply this Regulation, by means of a form conforming to the model in Annex 2 to this Regulation. The number of this Regulation, followed by the letter ‘R’, a dash and the approval number to the right of the circle prescribed in paragraph 15.4.1. 15.5. If the vehicle conforms to a vehicle type approved, under one or more other Regulations annexed to the Agreement, in the country which has granted approval under this Regulation, the symbol prescribed in paragraph 15.4.1 need not be repeated; in such a case the Regulation and approval numbers and the additional symbols of all the Regulations under which approval has been granted in the country which has granted approval under this Regulation shall be placed in vertical columns to the right of the symbol prescribed in paragraph 15.4.1. 15.6. The approval mark shall be clearly legible and be indelible. 15.7. The approval mark shall be placed close to or on the vehicle data plate affixed by the manufacturer. 15.8. Annex 4 to this Regulation gives examples of arrangements of approval marks. 450 mm for motor vehicles and trailers with hydropneumatic, hydraulic or pneumatic suspension or a device for automatic levelling according to load. In any case, a departure angle up to 8° according to ISO 612:1978 with a maximum ground clearance of 550 mm shall be deemed to satisfy the requirements. 500 mm or a departure angle according to ISO 612:1978 of 8°, whichever is less, for vehicles other than those in (a) above. In any case, a departure angle up to 8° according to ISO 612:1978 with a maximum ground clearance of 550 mm shall be deemed to satisfy the requirements. 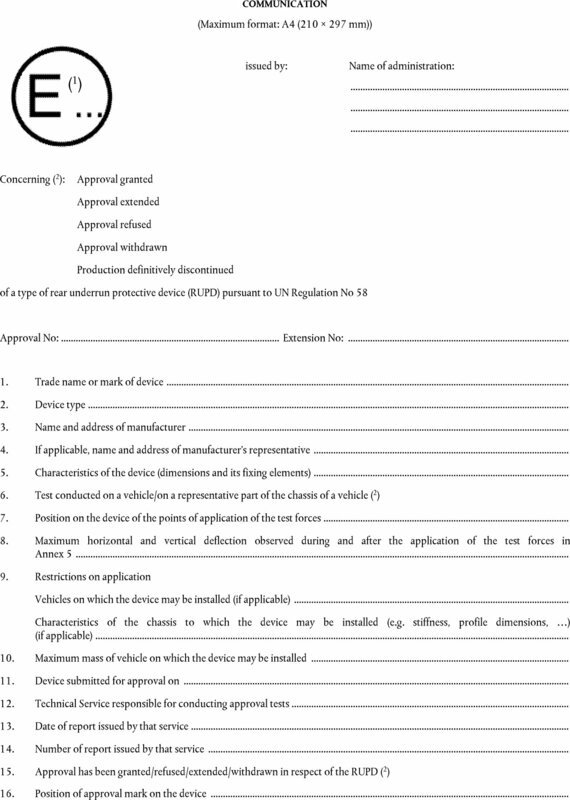 This requirement applies over the entire width of the motor vehicle or trailer and shall be such that the height above the ground of the points of application of the test forces applied to the device according to Part I of this Regulation and recorded in the type approval communication form (Annex 1, item 7) does not exceed the values in the paragraphs (a) and (b) above, increased by half the minimum section height required for the cross member of the RUPD. The height requirement for the application of the test forces shall be adjusted to the adjusted ground clearance due to the provisions for the departure angle specified above. 16.2. For vehicles of categories M, N1, N2 with a maximum mass not exceeding 8 t, O1 and O2, the ground clearance with respect to the underside of the protective device, even when the vehicle is unladen, shall not exceed 550 mm over its entire width and shall be such that the height above the ground of the points of application of the test forces applied to the device according to Part I of this Regulation and recorded in the type approval communication form (Annex 1, item 7) does not exceed 600 mm. 16.3. The width of the rear protective device shall at no point exceed the width of the rear axle measured at the outermost points of the wheels, excluding the bulging of the tyres close to the ground, nor shall RUPD be more than 100 mm shorter on either side. Where the device is contained in or comprises the vehicle bodywork which itself extends beyond the width of the rear axle, the requirement, that the width of the RUPD shall not exceed that of the rear axle, shall not apply. However, in case of vehicles of categories O1 and O2 where the tyres project for more than half of their width outside the bodywork (excluding the wheel guards) or outside the chassis in the absence of bodywork, the width of the RUPD shall not be less than 100 mm deducted from the distance measured between the innermost points of the tyres, excluding the bulging of the tyres close to the ground, on either side. Where there is more than one rear axle, the width to be considered is that of the widest rear axle. In addition the requirements of paragraphs 3.1.2 and 3.1.3 of Annex 5 relating the distance of the points of application of the test forces from the outer edges of the rear wheels (Annex 1, item 7) shall be verified and recorded in the type approval communication form. 16.4. For vehicles of categories M, N1, N2 with a maximum mass not exceeding 8 t, O1 and O2, the device shall be so fitted that the horizontal distance between the rear of the cross-member of the device and the most rearward point at the rear extremity of the vehicle, including any platform lift system, does not exceed 400 mm diminished by the largest total deformation including both plastic and elastic deformation (paragraph 7.3 of Part I) measured and recorded during the test at any of the points where the test forces are applied (Annex 1, item 8) during the type approval of the rear underrun protective device in conformity with the provisions of Part I of this Regulation and recorded in the type approval communication form. In measuring this distance, any part of the vehicle which is more than 2 m above the ground for every loading condition of the vehicle shall be excluded. For vehicles of categories N2 with a maximum mass exceeding 8 t, N3, and vehicles of categories O3 and O4, equipped with a platform lift or being designed as a tipping trailer, the same requirement as above applies; however, for vehicles of these categories, the horizontal distance shall not exceed 300 mm measured to the rear of the cross-member before the test forces are applied. For vehicles of categories O3 and O4, without any platform lift system and not being designed as a tipping-trailer, the maximum horizontal distances are reduced to 200 mm before the test forces have been applied and 300 mm diminished by the largest total deformation including both plastic and elastic deformation (paragraph 7.3 of Part I) measured and recorded during the test at any of the points where the test forces are applied (Annex 1, item 8). In any case non-structural protrusions such as tail lamps and those of less than 50 mm of size in any direction, such as rubber bumpers, resilient buffers, hinges and latches shall be excluded from the determination of the most rearward point at the rear extremity. Before the application of the test forces, the maximum allowed horizontal distance of a single, a segmented or an inclined cross-member of an RUPD is 100 mm between the rear of the cross-member measured at the most forward point and the rear of the cross-member measured at the most rearward point, measured in the longitudinal plane of the vehicle. 16.5. The device shall be so fitted that after the application of the test forces specified in Annex 5 for vehicles of the categories N2 with a maximum mass exceeding 8 t, N3, O3 and O4, the maximum ground clearance of the protective device, even when the vehicle is unladen, shall at any point not exceed by more than 60 mm the value before test. For vehicles with a departure angle up to 8° (paragraph 16.1) the maximum ground clearance shall not exceed 600 mm. 16.6. The maximum mass of a vehicle type for which approval is requested shall not exceed the value indicated on the type approval communication form of each approved RUPD intended to be installed on that vehicle. 16.7. Given the provisions of paragraph 7.2 for adjustable RUPD the label shall be placed clearly and permanently visible at the driver's place or at the rear area of the vehicle next to the RUPD, at a location, which is easily visible. Every vehicle approved under this Regulation shall be so manufactured as to conform to the type approved by meeting the requirements set out in paragraph 16 above. 18.1. The approval granted in respect of a vehicle type pursuant to this Regulation may be withdrawn if the requirements set forth above are not met. 18.2. If a Contracting Party to the Agreement applying this Regulation withdraws an approval it has previously granted, it shall forthwith so notify the other Contracting Parties applying this Regulation, by means of a communication form conforming to the model in Annex 2 to this Regulation. 19.2. Confirmation or refusal of approval, specifying the alteration, shall be communicated by the procedure specified in paragraph 15.3 above to the Parties to the Agreement applying this Regulation. 19.3. The Type Approval Authority issuing the extension of approval shall assign a series number for such an extension and inform thereof the other Parties to the 1958 Agreement applying this Regulation by means of a communication form conforming to the model in Annex 2 to this Regulation. If the holder of the approval completely ceases to manufacture a type vehicle approved in accordance with this Regulation, he shall so inform the Type Approval Authority which granted the approval. Upon receiving the relevant communication, that Authority shall inform thereof the other Parties to the 1958 Agreement applying this Regulation by means of a communication form conforming to the model in Annex 2 to this Regulation. Body work, chassis parts or other components, such that, by virtue of their shape and characteristics, these elements can be regarded as totally or partially fulfilling the function of the RUPD. 22.2. Other definitions applicable to this Part III are contained in paragraph 3 of this Regulation. 23.1. The application for approval of a vehicle type with regard to the protection afforded by the RUP shall be submitted by the vehicle manufacturer or by his duly accredited representative. A detailed description of the RUP: its dimensions, lines, constituent materials and position on the vehicle. 23.3. A vehicle representative of the type to be approved shall be submitted to the Technical Service responsible for conducting the approval tests. 23.3.1. A vehicle not comprising all the components proper to the type may be accepted for test provided that it can be shown by the applicant to the satisfaction of the Type Approval Authority that the absence of the components omitted has no effect on the results of the verification, so far as the requirements of this Regulation are concerned. 23.4. The Type Approval Authority shall verify the existence of satisfactory arrangements for ensuring effective checks on conformity of production before type approval is granted. 24.1. If the vehicle submitted for approval pursuant to this Regulation meets the requirements of paragraph 2.3(b) or paragraph 2.3(c) or paragraph 25 and has been tested following the conditions set out in paragraph 2.2, approval of that vehicle type shall be granted. 24.2. An approval number shall be assigned to each type approved. Its first two digits (at present 03 corresponding to the 03 series of amendments) shall indicate the series of amendments incorporating the most recent major technical amendments made to the Regulation at the time of issue of the approval. The same Contracting Party may not assign the same number to another vehicle type. 24.3. Notice of approval or of extension or of refusal of approval of a vehicle type pursuant to this Regulation shall be communicated to the Parties to the 1958 Agreement which apply this Regulation, by means of a form conforming to the model in Annex 3 to this Regulation. The number of this Regulation, followed by the letter ‘R’, a dash and the approval number to the right of the circle prescribed in paragraph 24.4.1. 24.5. If the vehicle conforms to a vehicle type approved, under one or more other Regulations annexed to the Agreement, in the country which has granted approval under this Regulation, the symbol prescribed in paragraph 24.4.1 need not be repeated; in such a case the Regulation and approval numbers and the additional symbols of all the Regulations under which approval has been granted in the country which has granted approval under this Regulation shall be placed in vertical columns to the right of the symbol prescribed in paragraph 24.4.1. 24.6. The approval mark shall be clearly legible and be indelible. 24.7. The approval mark shall be placed close to or on the vehicle data plate affixed by the manufacturer. 24.8. Annex 4 to this Regulation gives examples of arrangements of approval marks. 450 mm for motor vehicles and trailers with hydropneumatic, hydraulic or pneumatic suspension or a device for automatic levelling according to load. In any case a departure angle up to 8° according to ISO 612:1978 with a maximum ground clearance of 550 mm shall be deemed to satisfy the requirements. 500 mm or a departure angle according to ISO 612:1978 of 8°, whichever is less, for vehicles other than those in (a) above. In any case a departure angle up to 8° according to ISO 612:1978 with a maximum ground clearance of 550 mm shall be deemed to satisfy the requirements. 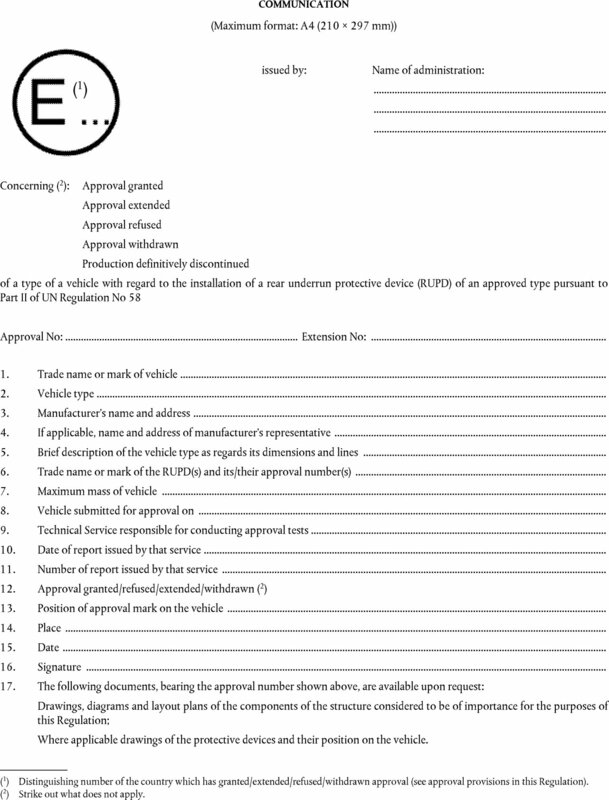 This requirement applies over the entire width of the motor vehicle or trailer and shall be such that the height above the ground of the points of application of the test forces applied to the device according to Part I of this Regulation and recorded in the type approval communication form (Annex 1, item 7) does not exceed the values in subparagraphs (a) and (b) above, increased by half the minimum section height required for the cross member of the RUPD. 25.2. For vehicles of categories M, N1, N2 with a maximum mass not exceeding 8 t, O1 and O2, the ground clearance with respect to the underside of the protective device, even when the vehicle is unladen, shall not exceed 550 mm over its entire width and shall be such that the height above the ground of the points of application of the test forces to the RUP does not exceed 600 mm. 25.3. For vehicles of categories M, N1, N2 with a maximum mass not exceeding 8 t, O1 and O2, the RUP shall be situated as close to the rear of the vehicle as possible. The maximum horizontal distance between the rear of the device and the most rearward point at the rear extremity of the vehicle, including any platform lift system, does not exceed 400 mm measured to the rear of the cross-member and recorded during the test when the test forces are applied. For RUP for vehicles of categories O3 and O4, without any platform lift system and not being designed as a tipping-trailer, the maximum horizontal distance is reduced to 200 mm before and 300 mm during the test when the test forces are applied. In any case nonstructural protrusions such as tail lamps and those of less than 50 mm of size in any direction, such as rubber bumpers, resilient buffers, hinges and latches shall be excluded from the determination of the most rearward point at the rear extremity. Before the application of the test forces the maximum allowed horizontal distance of a single, a segmented or an inclined cross-member of an RUPD is 100 mm between the rear of the cross-member measured at the most forward point and the rear of the cross-member measured at the most rearward point, measured in the longitudinal plane of the vehicle. 25.4. The width of the RUP shall at no point exceed the width of the rear axle measured at the outermost points of the wheels, excluding the bulging of the tyres close to the ground, nor shall RUP be more than 100 mm shorter on either side. Where the device is contained in or comprises the vehicle bodywork which itself extends beyond the width of the rear axle, the requirement, that the width of the RUP shall not exceed that of the rear axle, shall not apply. However, in case of vehicles of categories O1 and O2 where the tyres project for more than half of their width outside the bodywork (excluding the wheel guards) or outside the chassis in the absence of bodywork, the width of the RUP shall not be less than 100 mm deducted from the distance measured between the innermost points of the tyres, excluding the bulging of the tyres close to the ground, on either side. Where there is more than one rear axle, the width to be considered is that of the widest rear axle. In addition, the requirements of paragraphs 3.1.2 and 3.1.3 of Annex 5 relating the distance of the points of application of the test forces from the outer edges of the rear wheels (Annex 1, item 7) shall be verified and recorded in the type approval communication form. 25.5. The cross-member shall have a section height of at least 120 mm. The lateral extremities of the cross-member shall not bend to the rear or have a sharp outer edge, this condition is fulfilled when the lateral extremities of the RUP are rounded on the outside and have a radius of curvature of not less than 2,5 mm. For vehicles of the categories M, N1, N2 with a maximum mass not exceeding 8 t, O1, O2, vehicles of category G and vehicles fitted with a platform lift, the cross-member shall have a section height of at least 100 mm. 25.6. The RUP may be so designed to have several positions at the rear of the vehicle. In this event, there shall be a guaranteed method of securing it in the service position so that any unintentional change of position is precluded. The force applied by the operator to vary the position of the RUP shall not exceed 40 daN. For RUP that are designed to have several positions at the rear of the vehicle a label shall be provided in the language(s) of the country where the device is sold. Label minimum size: 60 × 120 mm. The label shall be placed clearly and permanently visible at the rear area of the vehicle next to the RUP to inform the operator about the standard position of the RUP to offer effective protection against under-running. 25.7. The RUP shall offer adequate resistance to forces applied parallel to the longitudinal axis of the vehicle and be connected, when in the service position, with the chassis side-members or whatever replaces them. This requirement will be satisfied if it is shown that both during and after the application of the forces described in Annex 5 the horizontal distance between the rear of the RUP and the most rearward point at the rear extremity of the vehicle, including any platform lift system, does not exceed 400 mm at any of the points where the test forces are applied. In measuring this distance, any part of the vehicle which is more than 2 m above the ground when the vehicle is unladen shall be excluded. After applying the test forces specified in Annex 5 for vehicles of the categories N2 with a maximum mass exceeding 8 t, N3, O3 and O4, the maximum ground clearance of the protective device, even when the vehicle is unladen, shall at any point not exceed by more than 60 mm the value before test. For vehicles with a departure angle up to 8° (paragraph 16.1) the maximum ground clearance shall not exceed 600 mm. 25.8. A practical test shall not be required where it can be shown by calculation that the requirements of Annex 5, paragraph 3, are met. Where a practical test is carried out, the device shall be connected to the chassis side-members of the vehicle or to a significant part of these or to other structural members. The individual elements of the underrun protection, including those outboard of the lift system, where provided, shall have an effective surface area, in each case, of at least 420 cm2. In the case of vehicles having a width of less than 2 000 mm and where it is impossible to achieve the requirements of paragraphs 25.9.2 and 25.9.3 above, the effective surface may be reduced on the condition that the resistance criteria are met. Every vehicle approved under this Regulation shall be so manufactured as to conform to the type approved by meeting the requirements set out in paragraph 25 above. 27.1. The approval granted in respect of a vehicle type pursuant to this Regulation may be withdrawn if the requirements set forth above are not met or if the vehicle has failed to pass the test prescribed in Annex 5. 27.2. If a Contracting Party to the Agreement applying this Regulation withdraws an approval it has previously granted, it shall forthwith so notify the other Contracting Parties applying this Regulation, by means of a communication form conforming to the model in Annex 3 to this Regulation. 28.2. Confirmation or refusal of approval, specifying the alterations shall be communicated by the procedure specified in paragraph 24.3 above to the Parties to the Agreement applying this Regulation. 28.3. The Type Approval Authority issuing the extension of approval shall assign a series number for such an extension and inform thereof the other Parties to the 1958 Agreement applying this Regulation by means of a communication form conforming to the model in Annex 3 to this Regulation. If the holder of the approval completely ceases to manufacture a vehicle type approved in accordance with this Regulation, he shall so inform the Type Approval Authority which granted the approval. Upon receiving the relevant communication that Authority shall inform thereof the other Parties to the 1958 Agreement applying this Regulation by means of a communication form conforming to the model in Annex 3 to this Regulation. 31.1. As from the official date of entry into force of the 03 series of amendments, no Contracting Party applying this Regulation shall refuse to grant or refuse to accept type approvals of vehicles, components or separate technical units under Parts I, II or III of this Regulation as amended by the 03 series of amendments. 31.2. Until 1 September 2019, Contracting Parties applying this Regulation shall not refuse to grant or refuse to accept type approvals of vehicles, components or separate technical units under Part I, II or III of this Regulation as amended by the 02 series of amendments. 31.3. As from 1 September 2019, Contracting Parties applying this Regulation shall grant approvals only if the type of vehicle, component or separate technical unit to be approved meets the requirements of Part I, II or III of this Regulation as amended by the 03 series of amendments. 31.4. As from 1 September 2021, Contracting Parties applying this Regulation shall not be obliged to accept, for the purpose of national or regional type approval, a vehicle, component or separate technical unit which is not type approved under Part I, II or III of the 03 series of amendments to this Regulation. 31.5. Until 1 September 2021, Contracting Parties applying this Regulation shall not refuse to grant extensions of approval for vehicles, components or separate technical units which comply with this Regulation as amended by the 02 series of amendments. However, Contracting Parties which are still accepting approvals according to the 02 series of amendments as given in paragraph 31.4 beyond 1 September 2021 shall not refuse to grant extensions to approvals after 1 September 2021. 31.6. Notwithstanding the transitional provisions above, Contracting Parties whose application of this Regulation comes into force after the date of entry into force of the most recent series of amendments are not obliged to accept approvals which were granted in accordance with any of the preceding series of amendments to this Regulation. Where applicable drawings of the protective devices and their position on the vehicle. (1) Distinguishing number of the country which has granted/extended/refused/withdrawn approval (see approval provisions in this Regulation). (2) Strike out what does not apply. of a type of a vehicle with regard to its rear underrun protection (RUP) pursuant to paragraph 2.3(b)/paragraph 2.3(c)/Part III (2) of UN Regulation No 58. The above approval mark affixed to a vehicle or to an RUPD shows that the vehicle type or RUPD type concerned has, with regard to the rear underrun protection in the event of a collision, been approved in the Netherlands (E 4) pursuant to UN Regulation No 58 under approval number 032439. The first two digits of the approval number indicate that the approval was granted in accordance with the requirements of UN Regulation No 58 as amended by the 03 series of amendments. The above approval mark affixed to a vehicle shows that the vehicle type concerned has been approved in the Netherlands (E 4) pursuant to UN Regulations Nos 58 and 31 (1). The approval numbers indicate that, at the dates when the respective approvals were given, UN Regulation No 58 included the 03 series of amendments and UN Regulation No 31 was still in its original form. (1) The latter number is given as an example only. 1.2. In the case of paragraph 1.1.2, the parts used to connect the RUPD to part of the vehicle chassis shall be equivalent to those which are used to secure the RUPD when it is installed on the vehicle.The part of the chassis can be fixed on a test bench as shown in the figure below, representing the minimum requirements to be fulfilled. The structures used as side rails shall be representative of the chassis of vehicles for which the underrun protection system is intended. The distance of the foremost fixing point of the RUPD from the rigid test bench shall not be less than 500 mm. If a diagonal strut is used to support the RUPD, this distance shall be measured between the foremost fixing point of the strut to the side rail structures and the rigid test bench. 1.3. At the request of the manufacturer and with the consent of the Technical Service the test procedure described in paragraph 3 may be simulated by calculation. The mathematical model shall be validated in comparison with the actual test conditions. To that effect, a physical test shall be conducted for the purposes of comparing the results obtained when using the mathematical model with the results of a physical test. Comparability of the test results shall be proven. A validation report shall be drafted by the manufacturer or by the technical service and submitted to the Type Approval Authority. Any change made to the mathematical model or to the software likely to invalidate the validation report shall be brought to the attention of the Type Approval Authority which may require a new validation process to be conducted. 1.4. In the case of an RUPD where the cross-member does not have a vertical flat surface of at least 50 per cent of the minimum section height of the cross-member according to paragraph 7.1 or 25.5 of this Regulation at the height of the points of application of the test forces according to paragraph 16.1 or 25.1, the manufacturer shall supply the Technical Service with a device that allows the application of horizontal test loads on the cross-member with the test equipment used by the Technical Service. The device shall not modify the dimensional and mechanical characteristics of the RUPD or increase its resistance during test. The device shall neither be rigidly fixed to the RUPD nor to the test equipment. 2.1. The vehicle shall be at rest on a level, flat, rigid and smooth surface. 2.2. The front wheels shall be in the straight-ahead position. 2.3. The tyres shall be inflated to the pressure recommended by the vehicle manufacturer. 2.4. The vehicle may, if necessary to achieve the test forces required in paragraph 3.1 below, be restrained by any method, this method to be specified by the vehicle manufacturer. 2.5. Vehicles equipped with hydropneumatic, hydraulic or pneumatic suspension or a device for automatic levelling according to load shall be tested with the suspension or device in the normal running condition specified by the manufacturer. 3.1. The requirements of paragraphs 7.3 and 25.7 of this Regulation shall be verified by means of suitable test mandrels; the forces for tests prescribed in paragraphs 3.1.1 and 3.1.2 below shall be applied separately and consecutively, via a surface not more than 250 mm in height (but covering the maximum section height of the cross-member or RUP, the exact height shall be indicated by the manufacturer) and 200 mm wide, with a radius of curvature of 5 ± 1 mm at the vertical edges. The RUP shall offer adequate resistance to forces applied parallel to the longitudinal axis of the vehicle. The surface shall not be rigidly fixed to the RUPD or to the RUP and shall be articulated in all directions. The height above the ground of the centre of the surface shall be defined by the manufacturer within the lines that bound the device horizontally. When the test is carried out on a vehicle the height shall not, however, exceed the height as specified in paragraphs 16.1 and 16.2 or as specified in paragraphs 25.1 and 25.2 of this Regulation when the vehicle is unladen. The order in which the forces are applied may be specified by the manufacturer. The device used to distribute the test force over the stated flat surface shall be connected to the force actuator through a swivel joint. The arrangement of the force actuator, whether pulling or pushing, shall be arranged such that it does not add any stiffness or stability to the underrun protection system structure, i.e. it shall neither increase the instability threshold force nor decrease the maximum deflection of the underrun protection system. 3.1.1. A horizontal force of 180 kN or 85 per cent of the force generated by the maximum mass of the vehicle, whichever is the lesser, shall be applied consecutively to two points situated symmetrically about the centre line of the device or of the vehicle whichever is applicable at a minimum distance apart of 700 mm and a maximum of 1 m. The exact location of the points of application shall be specified by the manufacturer. Notwithstanding the provision above for non-separate cab vehicles of category N2 with a maximum mass not exceeding 8 t, the horizontal forces may be reduced to 100 kN or 50 per cent. 3.1.2. In the cases defined in paragraphs 1.1.1 and 1.1.2 of this annex a horizontal force of 100 kN or 50 per cent of the force generated by the maximum mass of the vehicle, whichever is the lesser, shall be applied consecutively to two points located 300 ± 25 mm from the longitudinal planes tangential to the outer edges of the wheels on the rear axle or of the RUPD, if it exceeds the width of the rear axle, and to a third point located on the line joining these two points, in the median vertical plane of the vehicle. Notwithstanding the provision above for non-separate cab vehicles of category N2 with a maximum mass not exceeding 8 t, the horizontal forces may be reduced to 50 kN or 25 per cent. 3.1.3. Upon request of the manufacturer, the force levels can be reduced to 80 per cent of the requirement given in paragraphs 3.1.1 to 3.1.2 for the vehicles listed in Annex 6.
for the requirement under paragraph 3.1.2, at the intersection of the horizontal and vertical centerlines of each element furthest from the vertical centerline of the device or of the vehicle, whichever is applicable. These points should be a maximum of 325 mm from the longitudinal planes tangential to the outer edges of the wheels on the rear axle. 1.2. Vehicles fitted with a platform lift at the rear. Note: A reference such as A5/3.1.1 in the table indicates the annex (Annex 5) and paragraph (3.1.1) of that annex, where the relevant vehicle or requirement is described and specified. A reference such as 2.3 in the table indicates paragraph (2.3) of this Regulation, where the relevant requirement is specified. (*1) MaxM means maximum mass.